As some of you may have heard, my little Jack Russell Terror Abby, recently had surgery to remove a small (probably benign) mass from one of her toes and is wearing a very large pressure bandage for at least a week. Just to make the experience more fun for everyone, we have to keep the bandage dry during a deluge. We started off wrapping her bandaged paw in Saran wrap and Scotch tape every time she had to pee, looked like she had to pee or we thought she needed to go outside and pee. It got old REALLY fast. 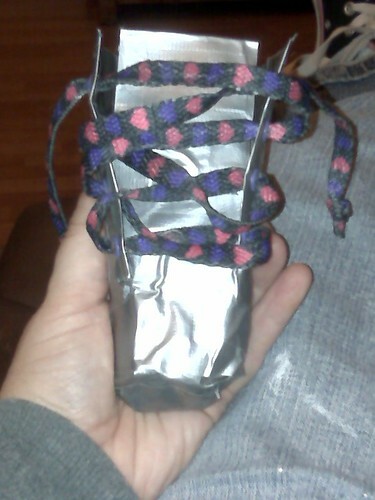 I looked up doggie shoes and bandage covers. At $30-60, they just weren't going to happen (we are already closer to $900 than $800 on this round of health care for our "free" dog). 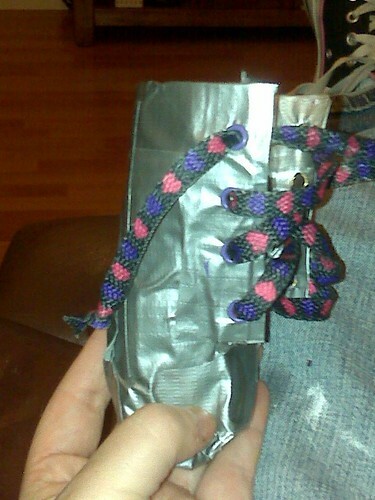 I decided to google "DIY dog waterproof boot" and found this awesome tutorial to make doggie shoes out of DUCT TAPE on my favorite place to geek out on DIY projects, Instructables.com. So for less than $1 of tape, my Crop A Dile & a few grommets and an old shoelace, I now have a reusable, easy-to-use waterproof doggie bandage protection! 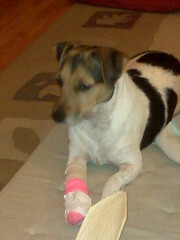 When I took Abby in for her bandage change this morning, I had the entire staff cracking up. ** Update: 12/15/09: I am happy to say that ABBY GETS TO KEEP HER TOE!!! The weird mystery mass was an inflamed squamous papilloma (a very expensive wart). Lab said our vet (the wonderful Jodi Van Tyne, DVM) got the entire mass. If it recurs, we'll at least know what it is. I love this idea! Great job on your doggie boots (and thanks for the link too). Awww...poor Abby. What a smart idea! Is It Competition or A Future "Intern?" FINALLY I Can Talk About This!